Newly renovated Business Class rooms. 8th floor is Business Class. All guest rooms have been completely renovated as of 2015. Free HBO in all guest rooms on our 37" TV's. Complimentary wireless internet service throughout hotel. Newly renovated fitness center with state-of-the-art equipment. Hotel offers indoor pool and complimentary parking. The Radisson Hotel Milwaukee West is conveniently located 10 miles from downtown and 15 minutes from the airport. We are within 20 minutes of all of Milwaukee's major attractions including the Milwaukee Zoo, State Fair Park, the county stadium, and Summerfest grounds. Milwaukee's museums, arts, and theatres are also within 20 minutes and we are located directly across the street from Mayfair Mall, Milwaukee's premier shopping mall. All rooms are very spacious and completely renovated. 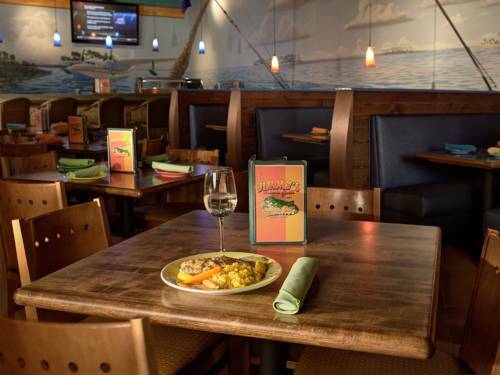 Jimmy's Island Grill & Iguana Bar: Jimmy's Island Grill & Iguana Bar serves pizza made in our wood burning oven, seafood and pasta dishes. Heritage Ballrom: 7500 feet of meeting space to accommodate up to 350. Five additional meeting rooms are available for smaller groups, functions, and meetings. Harley Davidson45 N to Silver Spring. Located at 11310 Silver Spring. Tours on State St. No weekend tours. Mon, Wed, and Fri 9:30 am, 11 am, and 1 pm. Tours last about 45 minutes. Group tours (7 or more) need reservations 2 weeks in advance. I-Max Theatre45 S to 94 E. Exit 7th St. Drive north to Wells St. 18-59 yrs $6.50 60+ $5.50 4-17 yrs $5.00 3 and under free 360 degree screen theatre. Milwaukee Public Museum45 S to 94 E. Exit 7th St. Turn right on Michigan. Drive north to Wells. Open 9 am to 5 pm. $5.50 adults, $4.50 seniors, and $3.50 4-17 yrs.